Draw the cheese holes on to the thicker foam rubber sheet using a pencil. Stick two pins into the board and attach a string for hanging up. For the mouse-pins, out of foam rubber cut two circles for the ears and a tear drop shape for the body. Stick the ears onto the body and using a felt tip pen, draw on eyes and a nose. Stick a pin into the end of the mouse and using a piece of raffia, tie the mouse to the pin leaving 5cm at the end to act as the mouse tail. 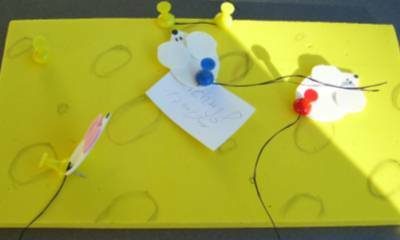 Make the other mice in the same way and stick onto the notice board.